The 450/400 3″ Nitro Express is a cartridge that not so many people write about, probably for the same reason that you don’t hear a lot about the 9.3×62 either: they are quiet achievers. The 450/400 3″ was an evolution of the older 450/400 3¼” Black Powder Express cartridge that was given a new lease of life when the British Cordite nitro smokeless powder made its debut in the late nineteenth century. The use of Cordite provided a great increase over the power of the 450/400 Black Powder Express, which had been a popular deer stalking caliber, and re-invented as the 450/400 3¼” Nitro Express it became a dangerous game cartridge suitable for use in Africa and Asia. The downside was that the original 450/400 3¼” cartridge case was not strong enough for the pressures developed and in its early Cordite loadings displayed a tendency to stick in the chamber of the double-rifles and single-shots it was used in. This was due to a couple of factors; one being that the case, and especially the rim, was not sturdy enough, and the other being that Cordite was a temperature sensitive propellant which would generate significantly higher pressures in the heat of the Tropics. 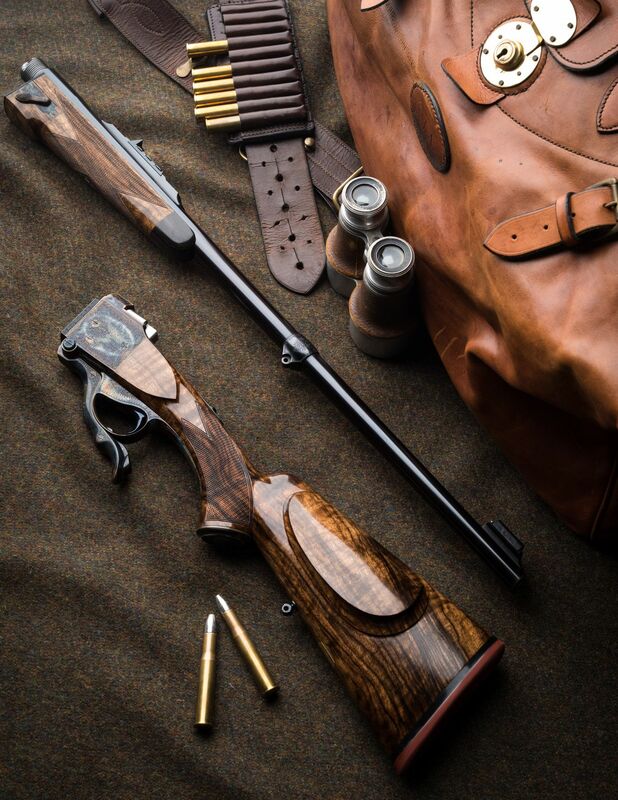 British gunmaker W.J. Jeffrey decided to solve both problems and he designed a new version of the 450/400 in 1902 which he called the 400 Jeffrey Nitro Express: other gunmakers also began using Jeffrey’s new design and called it the 450/400 3″ Nitro Express. W J Jeffrey Farquharson Falling Block Rifle 450/400 3″ Nitro Express. (Picture courtesy Guns International). W.J. Jeffrey’s new cartridge was made with a significantly thicker rim than its predecessor and was also made a quarter of an inch shorter at 3″ long, to ensure reliable extraction, something that was rather important if you had shot at a tiger and suddenly found it coming in your direction at rapid speed with a hungry look in its eyes: a situation in which a stuck case might prove rather worse than just irritating. Jeffery also provided two loadings for his new 400 Jeffrey Nitro Express; a standard load with 60 grains of Cordite, and a Tropical load with 55 grains. The 55 grain Tropical load turned out to be by far the most popular and it is quite rare to come across a vintage double rifle regulated for the 60 grain loading. The tapered shape of the 450/400 3″ makes it ideal for single-shot falling block rifles. The chamber opening is large making reloading an easy affair. (Picture courtesy Guns International). This .400 group of cartridges which includes the 450/400 3¼” Black Powder Express, 450/400 3¼” Nitro Express, and the 450/400 3″ Nitro Express (aka 400 Jeffrey Nitro Express) became the most popular double rifle cartridges of the period. This was because it established itself as the “all around” caliber, with a sufficiency of power for all game including elephant, yet with moderate enough recoil that most sportsmen and women could competently manage it. So excellent did Jeffrey’s 450/400 3″ Nitro Express prove to be that in 1909 he created his 404 Jeffrey as a rimless version of it. These cartridges remained unsurpassed up until 1912, when Holland & Holland introduced their .375 H&H Magnum and .375 Flanged Nitro Express which supplanted the 450/400 3″ as the “all around” cartridge. Watson Brothers boxlock double rifle chambered for the 450/400 3¼” Nitro Express. The 450/400 in both the older 3¼” and W.J. Jeffrey’s improved 3″ versions were very popular. (Picture courtesy Guns America). 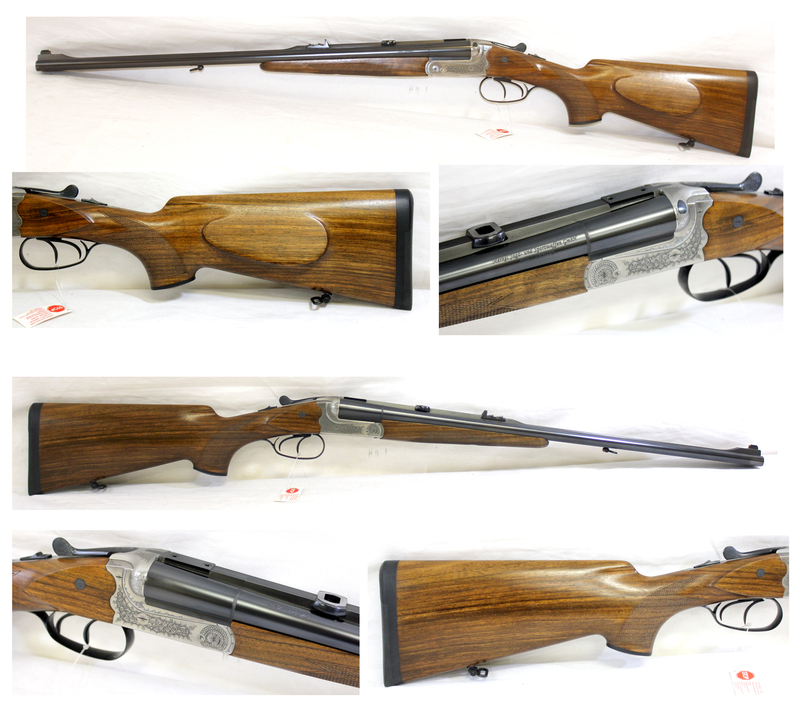 This then begs the question did the .375 Holland & Holland Magnum make the 450/400 3″ obsolete? 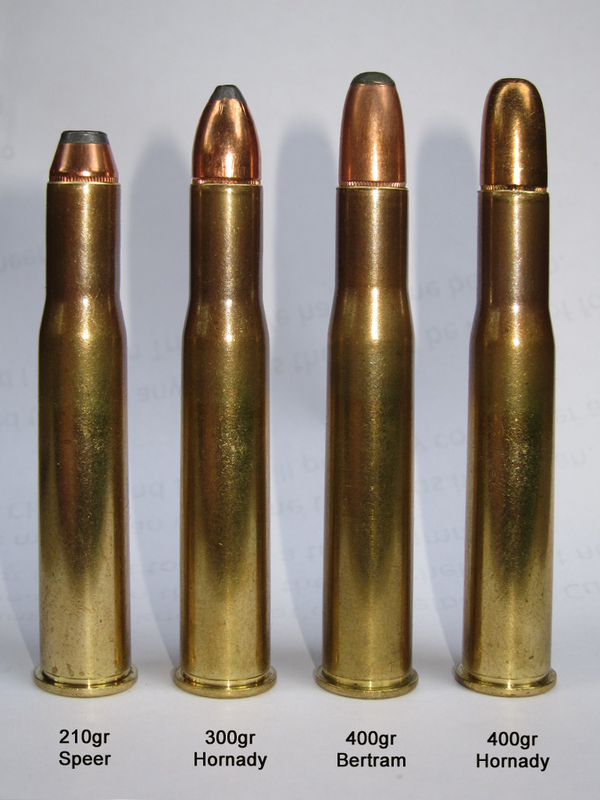 The .375 H&H in its original loadings provided three choices of bullet weight; 235 grains for thin skinned non-dangerous game at longer ranges, a 270 grain bullet for most game, and 300 grain bullet loadings for heavy dangerous game including elephant. Holland & Holland skillfully set up these three bullet weights to shoot to the same point of impact at 100 yards. This was attractive as the caliber could be used for deer stalking, plains game and heavy dangerous game. The light bullet high velocity loading made the .375 H&H Magnum usable out to 300 yards. The 450/400 could not compete with that: but it did fire a heavier 400 grain bullet at a decent 2050 fps with muzzle energy of 3734 ft/lb. The .375 H&H Magnum with its 300 grain bullet produced more energy at the muzzle, but less momentum: of note is that the .375 Flanged Nitro Express produced about the same energy as the 450/400 3″ Nitro Express, and less momentum. Westley Richards take-down Farquharson single-shot rifle chambered for the 450/400 3″ Nitro Express. (Picture courtesy theexplora.com). (Note: You will find the article on the above rifle at theexplora.com if you click here). Despite being overshadowed by the newer cartridges the 450/400 3″ Nitro Express continued to deliver reliable performance with manageable recoil right up until British ammunition maker Kynoch ceased production and subsequently manufacture of 450/400 3″ ammunition ended by 1970. After that time the only over .40 caliber dangerous game cartridge to remain in production was the .458 Winchester Magnum. The 450/400 3″ has not been consigned to obsolescence however. Two factors have emerged to put this old “all arounder” back into business, one being the past popularity of this cartridge resulting in a lot of excellent vintage single-shot and double rifles sitting unused for the want of ammunition, and the second being Ruger’s decision to do a limited production run of their No. 1 single-shot rifles in 450/400 3″ Nitro Express, with Hornady making ammunition for it. Ruger No. 1 in 450/400 3″ Nitro Express. Note that this rifle has a medium weight “C” profile barrel, not the heavy “D” profile barrel typical of the Tropical models. (Picture courtesy icollector.com). The Ruger No. 1 in 450/400 3″ has proved to be a superb rifle although there have been some who’ve been critical of its design. Having recently been given the opportunity to do some serious shooting with one I can say that I found the rifle to be nothing less than superb. The first impression when picking up the Ruger No. 1 in 450/400 3″ was that it was light and diminutive. The rifle has a medium weight 24″ barrel and is made in the style of the “Tropical” No. 1 rifles. Given that the weight of the 450/400 3″ No. 1 is 7¾lb I took the owner’s advice to “mount the rifle correctly – or it will hurt you” seriously. That being said I was shooting it in a competitive environment that required both slow fire and rapid fire segments and it was such a joy to use it was difficult to return it to its owner. It was light and point-able, the stock design being nice and straight kept the recoil pleasant and controllable, and the wide breech opening combined with the 450/400’s tapered case design meant that reloading was easy and fumble-free. Some have said that they experienced the big case rim of the 450/400 catching on the Ruger’s tang safety catch, but I’d have to report that I had no such issue: the cases were ejected smartly to the rear without fault, leaving an open breech ready to reload. The icing on the cake was that the trigger was superb, feeling like it broke at about 4lb. No doubt the rifle I tried has had some after-market gun-smithing done to ensure it was as good as a Ruger No. 1 can be, and shooting it was a great experience. Many will not be aware that Ruger made three versions of the No. 1 in 450/400 3″. Model 11324 (the model I used) was made with the same blued finish and Alexander Henry stock style as the No. 1 Tropical and Sporter rifles. These rifles were fitted with a 24″ “C” profile barrel with a diameter at the muzzle of .75″. There were also a few Ruger No. 1 450/400 3″ rifles made with the heavier “D” profile barrel which has a diameter at the muzzle of .815″. These are the model 11385 and less than one hundred were made. Weight of these rifles is 9¼lb which should make them quite docile to shoot. The third model was the, 11334 made as a Lipsey’s special Boddington African Adventure Series model. The 450/400 3″ “Buffalo” was the second in the series and 250 were made. These rifles have Circassian walnut stocks and a satin blued finish. A distinctive difference in this model is the rear sight which is a fixed open “V” complimented by an ivory bead front sight. The Lipsey’s Boddington African Adventure Series “Buffalo” Ruger No. 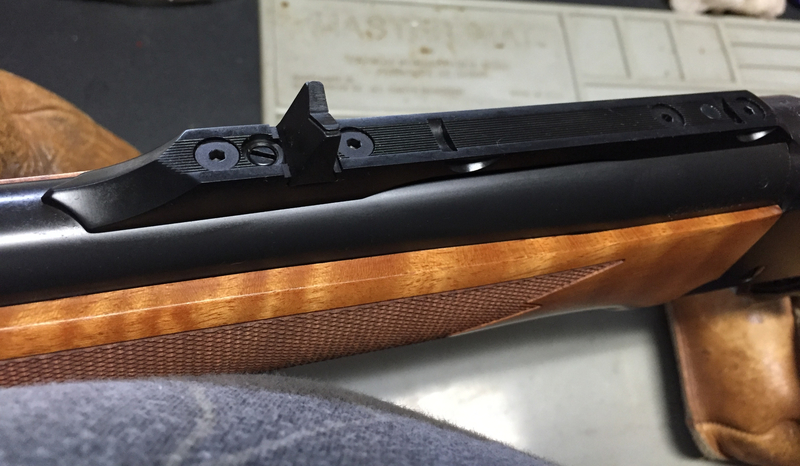 1 features an unusual fixed open “V” rear sight set into the quarter rib, and adjustable for windage. (Picture courtesy farrokhrt@africahunting.com). But getting back to the 450/400 3″ cartridge, the owner of the Ruger No. 1 rifle I had the opportunity to shoot, having accounted for a number of buffalo with it, decided to also purchase a Merkel double rifle and to have it made in 450/400 3″ Nitro Express, he liked the cartridge that much. Merkel double rifle in 450/400 3″ Nitro Express. These are more affordable than a British double rifle but fit and finish are excellent. (Picture courtesy Longwalker@africahunting.com). What is it about the 450/400 3″ that makes it so attractive to those who’ve had the opportunity to use one? As we noted in our own experience with a lightweight Ruger No. 1, this is a cartridge that lends itself to rifles that are light and handy, yet it possesses power with which it developed a reputation as being suitable for anything, including elephant, as long as the hunter does his/her part, and also uses the correct bullet for the job. The late John “Pondoro” Taylor rated it his favorite above all others, and few may know that American icon Elmer Keith rated it as a favored cartridge for Elk, Moose and the big bears. In short, it’s a cartridge that you can take deer stalking or on a driven wild boar hunt without feeling “over-gunned”, and on African safari without feeling “under-gunned”. It was created to be an “all around” cartridge back in 1902 and with modern handloads it can do things W.J. Jeffrey could not have foreseen. A picture is worth a thousand words: and this picture points to the reloading possibilities of the 450/400 3″ Nitro Express. (Picture courtesy TilleyMan@nitroexpress.com). Before you start thinking about reloading for your 450/400 3″ rifle there are a few considerations. First is that for older rifles you must check your bore and groove dimensions. Older 450/400 rifles may have a groove diameter of as little as .408″, because they were made with the idea that the barrel would squeeze a .411″ diameter projectile down such that it would pass through a .408″ groove diameter barrel. Whilst a very soft bullet might do that a modern bullet likely won’t without creating excessive pressures. It’s worthy of note that famous elephant hunter W.D.M. Bell mentions that the 450/400 jacketed bullets he used seemed to be very soft, something he did not like. You will find his comments on this on page 4 of his article “Small Bores Versus Big Bores” of December 1954 on American Rifleman. So if you are planning to shoot an older vintage rifle make sure to have it checked by a competent gunsmith first and make sure you know what size bullets to use: normally this will be .410″ or .411″. Original antique Farquharson 450/400 3¼” Nitro Express by London gunmaker Thomas Bland & Sons. Author visited their shop a number of times during the early 1960’s. (Picture courtesy Guns International). The easiest 450/400 rifles to reload for are the single-shots, and the easiest of them all are the Ruger No. 1, which are all chambered for the 450/400 3″ version. Load data for their 400 grain solid is published by Barnes on their website if you click here, and there are more loadings for that bullet in the Barnes Reloading Manual. Hornady also list load data for the 450/400 3″ using their 400 grain DGX and DGS bullets in their 9th Edition manual, whilst the Woodleigh Bullets Loading Manual has load data for both the 450/400 3″ and the 450/400 3¼”, again only with 400 grain bullets. There are various loads to be found on internet forums such as can be found here on the nitroexpress.com forum. The loadings mentioned there are often for Australian ADI powders, which are sold in the United States under the Hodgedon brand. You can find information and the ADI/Hodgedon equivalence table in a Revivaler post we did on that subject if you click here. Please note that this is not a relative burning rate equivalence but they are the same powders under different names as sold in different markets. For example, the Hodgdon Varget powder as sold in the US is sold under the ADI name AR2208 in Australia and New Zealand: same powder off the same production line, just different names for different markets. Just remember that loads found on Internet forums must be checked against a reliable source, such as the Woodleigh Bullets Loading Manual which you can purchase directly from Woodleigh Bullets if you click here, or from Amazon in the United States if you click here. 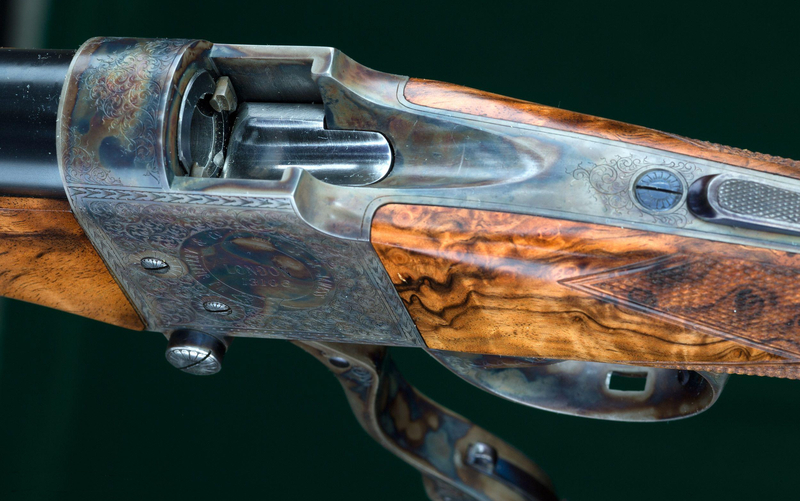 Custom .450/400 3″ double rifle built on a Holland & Holland Royal shotgun receiver from 1888. Serial number is 12028 and the rifle has 22″ barrels with a matted rib that incorporates a pair of leaf express sights (one standing and unmarked, folder indicating “150”), along with Recknagel Eramatic quick-release mounts securing a Swarovski Z6 1.7-10×42 scope with plex reticle. (Picture courtesy Guns America). The 450/400 3″ was designed by W.J. Jeffrey back in 1902 as an “all around” cartridge that would be suitable for deer stalking in England’s green and pleasant land, and for dangerous game in the outposts of the Empire in India and Africa. It did all these things admirably back in the early years of the twentieth century, and it’s still doing the same job over a century later. It is a cartridge that will serve just as well in the United States and Canada, especially for the larger deer species and bears to be found in the north. In Australia it has earned a reputation as being a good choice for Sambar deer and Asian Buffalo. If you are looking for a rifle cartridge that is capable of safely dropping a dangerous game animal, up to and including elephant, but which you can use on deer, and have in a lightweight and handy rifle with moderate recoil, then the 450/400 3″ is well worth considering. Not many cartridges offer the features that this one does. W.J. Jeffrey double rifle in 450/400 3″ fitted with Schmidt & Bender 1¼-4×20 rifle-scope. (Picture courtesy icollector.com). (Feature image at the head of this post courtesy africanhuntinggazette.com).